Live in hinges are a great way to marry to haves of a component together. However it should be noted that Live in hinges are not meant for multiple use or continuous duty. Make sure that the material selection for your part supports live in hinges. Many materials cannot flow through the thin wall section of the hinge thus causing the part to not be mold-able. Furthermore, live in hinges require plastic materails that remain flexible when they are molded into thin wall sections. If this important note is ignored, your live in hinge may crack and fail on first use. Snaps and clips are a great way to eliminate screws in the assembly of your project. 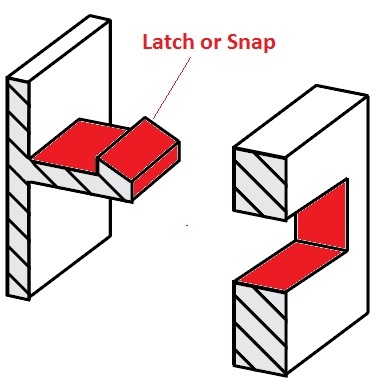 When incorporating snaps, consider the tooling cost that will surely rise with these features. Often these features cause your part to have undercuts. These undercuts will require additional tooling cost, that can mount really fast when multiple clips are integrated into your design. Furthermore, these features often hang off a class a surface of the part often causing sink issues if the proper guidelines are not followed.